In August 2004 a group of “dog people” held a meeting to discuss the plight of our native British & Irish dog breeds. The extremely low registration figures of some of these breeds were discussed and those of us present decide it was time to try and do something to protect these breeds. From this meeting the British & Irish Dog Breeds Preservation Trust was born. The aims of the “Trust” may appear quite simple Education, Preservation and Promotion. However reversing the downward spiral of many of these breeds is far from simple! There is no quick fix solution for this problem; it will, I believe, take many years of dedicated work to ensure the future of these breeds. Did you know that in 2007 only 37 Skye terrier puppies were registered in the UK? Compare this figure with more than 46,000 Labrador puppies being registered in the same time frame and you will begin to realise how serious this problem is. Why are these breeds suffering from such a low level of popularity? With many of the breeds it is simply a matter that people have forgotten they exist. When I take my Skye terriers out for a walk I am invariably stopped by people running over and asking “What is it? I’ve never seen a dog like that before”. Naturally if people aren’t aware that a breed exists they will not consider that breed when they are looking for a dog, therefore it is important that we remind people about these breeds. There really is a breed on the list to suit any lifestyle and any dog loving owner. Welsh Terrier 377 registered in 2007. Sadly you will see that 12 of the 22 breeds on our list are terriers but as you can see from the figures all of these breeds really do need our support to ensure their future. One of the things we do at the Trust is to attend shows, game fairs Kennel Club events etc to try and bring these breeds to the public’s attention. At Crufts this year we held a parade of endangered breeds in the main ring. 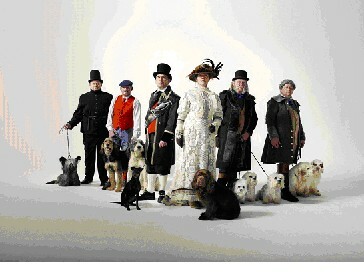 The parade was held on Best in Show day with all of the handlers dressed as historical character connected to their breed. We had John Gray and Bobby the Skye, the Duke of Newcastle with his Clumber Spaniels, Beatrix Potter and her Lakeland terrier and many more beside. This parade was hugely popular with the audience and gained a lot of much needed publicity for the endangered breeds. We have to remember that these breeds are a part of our living heritage, we must do something to safeguard their future. There is a lot of work to be done if we are to preserve them, you can do your part by becoming a member of the Trust. Membership is only £10 per person a year so please consider joining; it really is a worthwhile cause. To get a membership form or further information you can email me at suebreeze@gmail.com or visit our website www.nativebreeds.org where you can download a membership application form and learn more about us. Secretary British & Irish Dog Breeds Preservation Trust.